Atlantic City, NJ, 1990. Limited. unbound. Lewis, Ron. 23.5 x 35.75 inches (including the white borders), No. 426 of 1,000, illustrated in 1990 by renowned sports artist Ron Lewis. The poster shows every member of the world champion 1961 New York Yankees, posing in three long rows on the outfield grass. 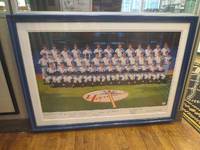 Signed by 33 players and coaches, including Hall of Famers Mickey Mantle, Yogi Berra, Whitey Ford. Other notable signatures include Moose Skowron (an eight-time All-Star), Ryne Duren (a four-time All-Star), Bob Turley (a Cy Young Award winner and three-time All-Star), Tom Tresh (the 1962 American League Rookie of the Year), Ralph Terry (the 1962 World Series MVP), Luis Arroyo (a two-time All-Star), Al Downing (who famously surrendered Hank Aaron's 715th career home run), manager Ralph Houk (who had taken over for Casey Stengel), and pitching coach Johnny Sain (a three-time All-Star and six-time world champion). Also signed by artist Ron Lewis. Matted in white and set in a blue wooden frame measuring 30 x 42 inches. Near fine condition. In 1990, at the Trump Castle in Atlantic City, New Jersey, the 33 then-living members of the 1961 Yankees gathered for an unprecedented group signing.